The phrase, wrapped in an enigma and shrouded in mystery, comes to mind whenever the topic of discussion in this country is either taxes or unions. Taxes and unions exert an influence on our society, but their actual impact on our economy is more often the object of bombastic rhetoric than of studious analysis. There is one fact about taxes and unions in America that can be stated with clarity, and that is, that both taxes and union representation in the United States of America are lower than in any other industrialised nation on this planet. Consider the following contribution to the discussion on taxes. Are Taxes in the US High or Low? Historically, the term “tax rate” has meant the average or effective tax rate - that is, taxes as a share of income. The broadest measure of the tax rate is total federal revenues divided by the gross domestic product. By this measure, federal taxes are at their lowest level in more than 60 years. The Congressional Budget Office estimated that federal taxes would consume just 14.8 percent of GDP this year (2008). The last year in which revenues were lower was 1950, according to the Office of Management and Budget. The postwar annual average is about 18.5 percent of G.D.P. Revenues averaged 18.2 percent of G.D.P. during Ronald Reagan’s administration; the lowest percentage during that administration was 17.3 percent of GDP in 1984. In short, by the broadest measure of the tax rate, the current level is unusually low and has been for some time. Revenues were 14.9 percent of GDP in both 2009 and 2010. Yet if one listens to Republicans, one would think that taxes have never been higher, that an excessive tax burden is the most important constraint holding back economic growth and that a big tax cut is exactly what the economy needs to get growing again. Just last week, House Republicans released a new plan to reduce unemployment. Its principal provision would reduce the top statutory income tax rate on businesses and individuals to 25 percent from 35 percent. No evidence was offered for the Republican argument that cutting taxes for the well-to-do and big corporations would reduce unemployment; it was simply asserted as self-evident. One would not know from the Republican document that corporate taxes are expected to raise just 1.3 percent of GDP in revenue this year, about a third of what it was in the 1950s. The GOP says global competitiveness requires the United States to reduce its corporate tax rate. But the United States actually has the lowest corporate tax burden of any of the member nations of the Organization for Economic Cooperation and Development (OECD). 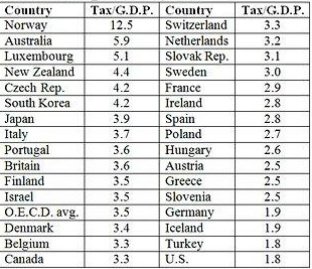 If taxes are low historically and in comparison with our global competitors, how are Republicans able to maintain that taxes are excessively high? They do so by ignoring the effective tax rate and concentrating solely on the statutory tax rate, which is often manipulated to make it appear that rates are much higher than they really are. For example, Stephen Moore of The Wall Street Journal recently asserted that Democrats were trying to raise the top income tax rate to 62 percent from 35 percent. But most of the difference between these two rates is the payroll tax and state taxes that are already in existence. The rest consists largely of assuming tax increases that no one has formally proposed and that would be politically impossible to enact at the present time. Nevertheless, one routinely hears variations of the Moore argument from conservative commentators. By contrast, one almost never hears that total revenues are at their lowest level in two or three generations as a share of GDP or that corporate tax revenues as a share of GDP are the lowest among all major countries. One hears only that the statutory corporate tax rate in the United States is high compared with other countries, which is true but not necessarily relevant. The truth of the matter is that federal taxes in the United States are very low. There is no reason to believe that reducing them further will do anything to raise growth or reduce unemployment.